It's about time that someone pricked the fraudulent "Saudi America" narrative that the oil industry and its allies have been peddling successfully to the media for the past several years -- and a new movie Pump the Movie does exactly that. According to the current petro-fantasy, a domestically significant, but globally marginal, increase in US production of light-tight oil means the end to concerns about over-reliance on petroleum, the return of affordable prices at the pump, even a world-wide glut of oil. Happy days are here again, thanks to the US oil boom, we read in the New York Times and even in the once numerate Wall Street Journal. Tell it to ISIS making a fortune on a trivial amount of black-market oil production it controls. Tell it to Vladimir Putin, who is staring down the European Union from his perch as Europe's primary provider of $100 oil. Or, as The Pump points out, tell it to US drivers who are still paying over $3/gallon for gas. Only a few years ago the idea of oil at $100 was terrifying. Now the oil industry is well down the road toward selling us on the idea that it is unavoidable -- indeed that we should be looking forward to oil at $120 or higher. The movie, produced by the Fuels Freedom Foundation, puts today's global oil landscape in the proper historic perspective, tracing how oil's current monopoly as a transportation fuel emerged. First came John D. Rockefeller's successful efforts to leverage prohibition to kill off Henry Ford's plan to rely on alcohol as the primary driver of the automotive revolution. In the '30s General Motors conspired with Chevron, Firestone and Mack Truck to shut down America's streetcar system. The recent assault on ethanol as a fuel was, similarly, funded and managed by the oil industry and its hired guns. Pump next takes us on a survey of the fuels that ought to be competing with oil for our transportation dollar -- because they all cost less than gasoline or diesel -- electric vehicles, natural gas fuels, or biofuels derived from agricultural or municipal wastes or dedicated crops. It argues that a huge portion of today's cars could actually operate on ethanol or methanol derived from natural gas or biomass with truly trivial software and fuel line modifications, while fleet turnover will more slowly take us to a largely electric vehicle future. It uses Brazil as a powerful counter-narrative, a country that did break oil's monopoly at its pumps, and convincingly argues that the alternatives to oil are both better and cheaper -- if they could get into the market. While the film acknowledges that "we need a moment of truth with ourselves and our policy makers," it is probably weakest in connecting our current dilemma to a broad range of policy favors lubricated by oil industry dominance of our campaign finance system. And I admit to skepticism that America's "do it yourself hacker" culture is sufficient to make a meaningful dent in oil dependence -- most of us could not learn to program our VCRs. Political leadership is going to be a bigger part of any eventual solution at scale. 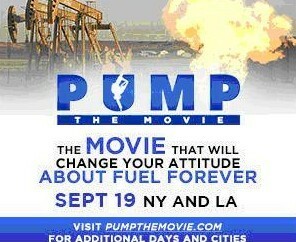 But every reporter writing on energy ought to have to see this movie before they open the next oil industry- or Koch Brothers-funded press release or factoid-laced "analysis." This powerful counter-narrative is badly needed and hopefully just in time.